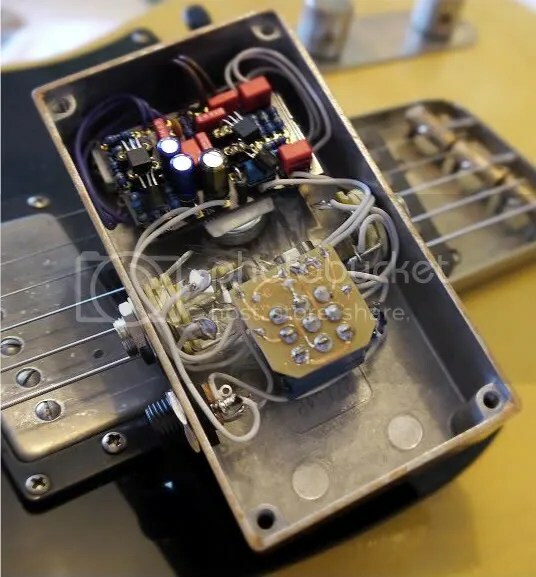 Here are a few photos of a Catalinbread Formula No.5 clone I built for myself. I got the schematic from the Madbeanpedals forum (an amazing forum and resource), and designed my own PCB. Its another cascaded JFet desgin (like the DLS), which results in a real dynamic and responsive tone. JFet based overdrives are definitely my favourite style of dirt pedal, they just seem a lot more responsive to me. The pedal sounds super cool, and at higher gain can cop a cool Neil Young style tone. At medium gain its also perfect for a bit of Keef. Like the tweed amps its based upon, as you turn up the gain, the tone control has less of an effect. Like all Catalinbread pedals I have tried, built and owned, this one is a winner for sure. I would highly recommend all Catalinbread pedals.